Dennis Leung, MS, Mark Talamonti, MD, Marshall Baker, MD, Woody Denham, MD, Amanda Hayman, MD, Michael Ujiki, MD. NorthShore University HealthSystem, Chicago, IL. Background: The pancreatic remnant is a significant source of morbidity after distal pancreatectomy. Oversewing the transected pancreas has been shown to decrease leaks but can be challenging laparoscopically. 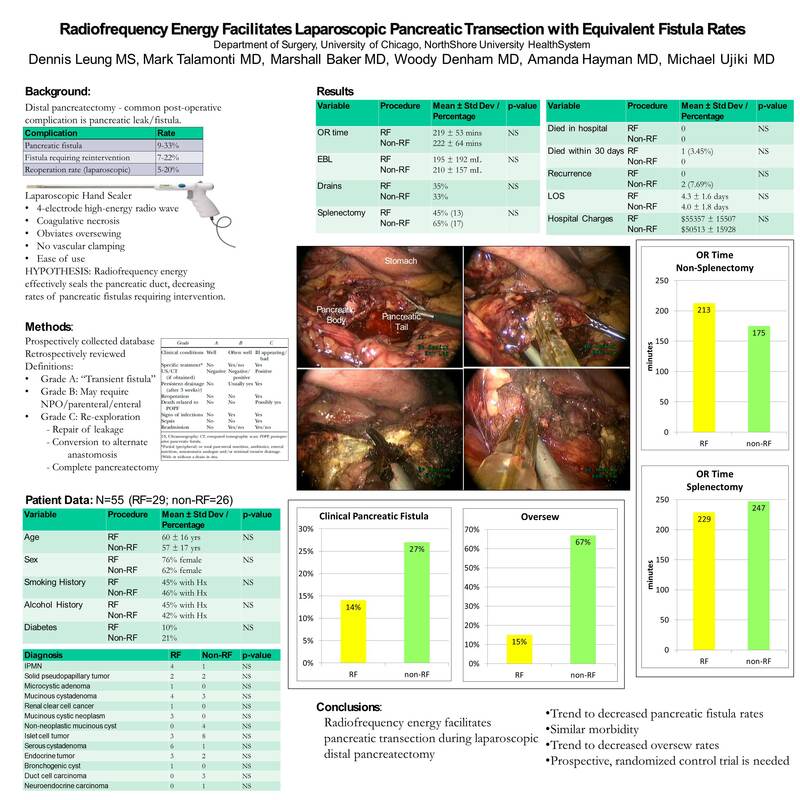 We hypothesized that radiofrequency energy (RF) would seal the pancreatic cut-edge after laparoscopic distal pancreatectomy without the need to oversew. Methods: This study is an IRB-approved retrospective review of prospectively collected data. Demographic, perioperative, and pathologic variables were compared. Pancreatic leaks were rated according to the International Study Group definitions. Univariate analyses were performed (two-sample t-test, Wilcoxon two-sample test, chi-square, Fisher’s exact, or Pearson’s were implemented depending upon the variable). Results: Between 2007-2010, 55 patients underwent laparoscopic distal pancreatectomy. Thirty patients (54.5%) were transected with RF. Both groups were equivalent in terms of demographic and pre-operative variables. In the RF group, only 15% were oversewn and 5 patients (16.7%) developed pancreatic leaks; in the non-RF group, 100% were oversewn and 6 patients (20%) developed pancreatic leaks. Fistula rates were equivalent (p=0.2). Blood loss (RF 195 ± 192.4 vs. non-RF 209.6 ± 156.86mls, p=0.39), operative time (RF 219.3 ± 53.26 vs. non-RF 222.23 ± 64.19, p=0.83), length of stay (non-RF 4.04 ± 1.78 days vs. RF 4.34 ± 1.63 days, p=0.33), and hospital charges (non-RF 50513.1 ± 15927.9 vs. RF 55357.4 ± 15507.2, p=0.23) were equivalent between groups. Conclusions: Radiofrequency energy facilitates pancreatic transection during laparoscopic distal pancreatectomy by alleviating the need to oversew with similar pancreatic fistula rates.